The cheapest and best joystick-waggling sports simulation available. Because of ten very physical events. And two on-screen contestants who will bend your biceps and trigger your adrenaline. When the competition begins, you'll see. Hints You might try holding the joystick differently to see which way is the easiest for you to get speed and power. In the long jump, shot put, javelin, and discus events, try to get a good first score, then really push yourself on the next two attempts. Since you already have a score, there is no chance of scoring zero points. "The idea for Decathlon was to have a video game that people could actually work up a sweat playing - it was meant to be different than what people normally associated with 'video game'. The 'wiggle' joystick interface game was fairly unique at the time, too. We made it so that you really had to work to get your athlete to move." 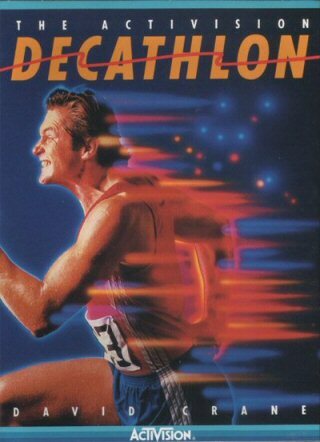 Anyone who's tried finishing "All events" will certainly testify that you can work up a sweat quite easily playing Decathlon! The Commodore 64 version was essentially the same game as the Atari 2600 version, with improved graphics and sound. In addition to Decathlon, David Crane also worked on Little Computer People Project and Pitfall. He is still working in the computer game industry for a company he co-founded called Absolute Entertainment.